Forex or CFD — Where Should I Start? Forex and CFD trading might seem similar and traders can often confuse themselves in figuring out which is a better market to start trading. At the outset, traders should understand that there is no better market, as forex and CFD’s, although similar are very different when compared. As a trader, the first step is to understand your risk profile and your initial capital that you would like to start trading with. For someone trading with $500, it is best to stick to the forex markets while for others who have larger capital amounts to trade with, CFD’s can also be traded. The bottom line is that both the markets (forex and CFD’s) are volatile and uncertain and there is no unique advantage or an edge that a trader gets if they opt for one market over the other. CFDs and forex are quite similar considering that the transactions are executed over-the-counter (OTC). Whether you want to trade CFD’s or Forex, you can trade in both rising and falling markets, meaning that you can buy (go long) as well as sell (short) the markets. Trades are executed on the same platform and are processed electronically through the network of banks and not at a centralized exchange. CFDs and forex also carry similar transaction costs, which could be a commission on the trade or the spread as well as the overnight rollover swaps. Whether you want to trade CFD’s or forex, the fact remains that the trades do not entitle you to any sort of actual ownership of the underlying security that is being traded. For example, if you were trading the EURUSD, you do not own the euros, but merely speculate on whether the euro will rise or fall, relative to the US dollar. Similarly, if you were trading a commodity CFD such as oil, you do not actually own a barrel of oil. With the similarities between CFD’s and forex covered, the obvious question is what sets them apart. The biggest difference between a CFD and a forex contract is the fact that CFD’s cover a diverse range of markets. While forex is limited to the currency markets, CFD contracts can range from a stock CFD, commodity CFD or indices CFD. Based on the contract being chosen for CFD trading, you can expect variations in terms of the minimum tick size, the base currency and the lot size as well. With forex, the lot size is uniform regardless of whether you trade EURUSD or USDCAD. On the fundamental aspect, the price fluctuations in a CFD contract depend on the markets. For example trading a CFD for indices such as the German DAX is influenced by the respective stocks in the index, earnings and so on. With forex, the fundamental aspects that determine the currency’s movement is based on economic factors and global macroeconomic events. If a stock is trading at $50 and you purchased 100 shares, your initial cost of the transaction amounts to $5,000 (100 shares x $50). Now, when you trade on margin, say 50%, your transaction cost now comes to only $2500. If you were to trade the same stock via CFD’s which require only a 10% margin, your equity investment now comes to only $500. The above example shows Alcoa’s shares. 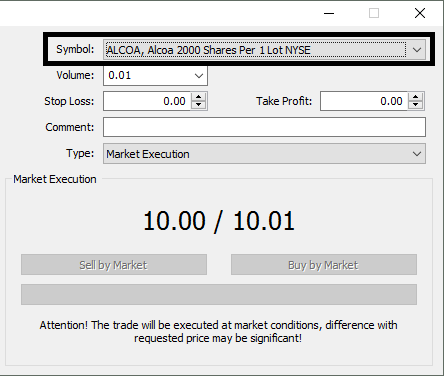 Note that besides the margin, there is a negative swap of $2 that is applied to long or short positions in Alcoa. With CFD’s, although the transaction costs are lower you still need to pay the spread. Therefore, if the spread was 5, then your CFD transaction opens with a loss equal to the spread. In order to realize a profit, the stock needs to move a minimum of 5 cents to initially break even on your trade and then realize some profits. Some brokers charge a commission on CFD transactions as well. The above example illustrates the point that CFD trading is ideal if you want to trade an instrument that would typically require a higher equity investment. Therefore, a stock trader could trade CFD’s lowering their equity costs rather than owning the shares. Also, with CFD trading, because you do not own the shares, it is more suited for speculative trading rather than investing. 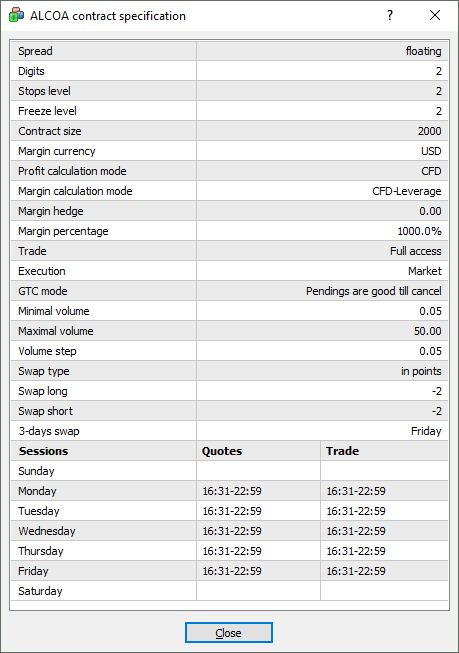 Besides, the spread, CFD contracts also come with rollover or overnight swaps which are determined by the broker. CFD contracts are also subject to dividend payouts. Therefore, if you were long on a CFD contract for a stock and the company announced dividends, that amount would be credited to your long position. However, if you were short on a stock and the dividends were paid out, that amount is deducted from your position. Forex trading is a lot more straightforward compared to CFD trading. 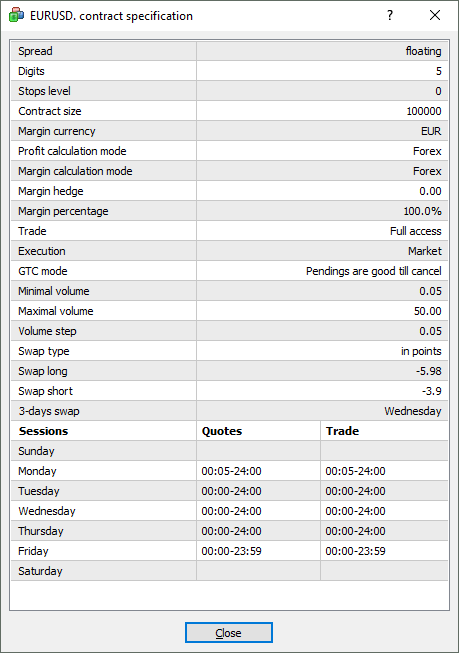 For starters, you can trade from as little as 0.01 lot or 1000 contracts. With forex, when you trade a currency pair, you are essentially buying one currency and selling the other. So a long position in EURUSD means that you are buying euros and selling dollars. With forex, the margin requirements are far less compared to CFD trading contract specifications. The picture below shows an example of a EURUSD position. 1 lot equals $100,000 units. So a long EURUSD position for 1 lot infers that you are selling 100,000 US dollars. The margin size requirement for a 1 lot transaction requires 200% margin. Therefore, if you bought EURUSD at 1.12826, your actual transaction size would amount to 100,000/200 * $1.12826 = $564.13. With forex, the lot size remains the same, which is 100,000 units of the base currency that you are buying or selling. Forex contracts are also subject to rollover swaps which vary on long and short positions as well as the currency pairs in question. In conclusion, whether you want to trade CFD or forex, the choice is entirely up to the trader. To best determine which of the two you want to trade, start by looking at your leverage and your trading capital. Then, ensure that you fully understand the markets in question as well as determining your risk tolerance and your goals for making profits. CFD’s are diverse and vary from one security to another, therefore pay attention to the individual securities and proceed accordingly.